Whether your goal is to organize the home or office, Brother P-touch® Label Printers from PtouchDirect.com will get the job done. Choose from a high-quality selection of label makers and printers from Brother P-touch® that are reliable, easy to use and affordable. With all of the label printers on the market, what makes Brother P-touch® stand out from the pack? First off, they are so simple to operate that you will wonder why you waited so long to get a label printer. The Brother P-touch® labeling system allows you to print labels on demand. Each model includes fabulous features such as a built-in keyboard for convenient use, automatic tape cutters as well as time/date printing among others. Won’t the time/date printing take the guess work out of your filing system? So many people list organization as a goal every New Year’s Day. Let this year be the year that you actually do put your home and business in order with a Brother P-touch® label printer. Moving? No sweat. With a label maker, tagging and marking those boxes according to room and contents is a snap. Afraid you will get all of your boxes labeled and then turn around to see them all peeling off? It’s a valid concern because experience is a great teacher. However, that just won’t happen with a Brother P-touch ® Label Printer. Why? Each label is made with a unique lamination formula that resists heat, cold, chemicals, moisture and is even fade resistant. Yes, you can finally get the garage, shed and even the cool, damp basement organized. With PtouchDirect, you get quality customer service. All of our printers are factory direct and will be delivered right to your doorstep. Choose from hand-help label printers to desk models that work with your PC or Mac. You will also have access to a free downloadable label printer user guide. Discover a world of organization whether it is at home, the office, school or your retail storage room. The uses for a Brother P-touch® Label Printer are almost limitless. Everything from the pantry to the basement storage closet can be clearly marked with colorful and durable labels. Are you ready to simplify your world with Brother P-touch®? Why Choose a Brother P-Touch Labeling System? Brother P-touch labeling systems are equipped with easy-to-use, convenient features that allow you to print labels on-demand. Use Brother P-touch labels to organize your home or office, in the field or on the go. With features such as built-in keyboards, automatic tape cutters, time/date printing and so much more, the Brother P-touch labeling system allows you to print the labels you want when you want them to meet all of your labeling needs. NEW - PtouchDirect Size/Color Tape Guides - take the guesswork out of selecting label tapes! From handheld and desktop models to label printers that work wirelessly with your PC or Mac, P-touch electronic label makers produce durable, colorful labels. Almost all of the P-touch products print on laminated labels that are resistant to water, spills, heat, cold and other harsh environments. Applications for P-touch labels are virtually infinite. And P-touch labelers are easy to use. Millions of people have already found the P-touch labeler to be an effective way to organize their homes and businesses. Label almost anything, anywhere. 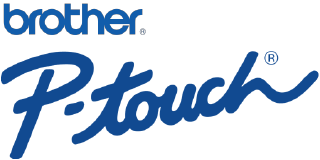 Why shop Brother P-touch Printers at PtouchDirect? Get Brother label printers direct to your door - getting organized is now easy. PtouchDirect.com guarantees delivery satisfaction: We offer fast and inexpensive and even free shipping options on our Brother p-touch label printers. Discover the PtouchDirect.com difference today! Brother P-touch TZe tapes are the only label tapes available that have a unique lamination, which makes the tze labels heat, cold, water, chemical and fade resistant (perfect for use outdoors, cold environments and near food). Brother's p-touch tape labels are extremely durable, have a professional finish and will outlast other label tapes. Unlike ordinary labels, Brother labels use laminated tze tapes for exceptional durability. The lamination ensures that it's resistant to smudges, stains, streaks, marks, rips, fading and peeling. PtouchDirect.com guarantees quality: All the label printers we sell are factory direct - no third party labels, no generic names - just brand new Brother P-touch Printers factory sealed and delivered to your door. That goes for our factory refurbished printers as well, these printers come factory packed and carry Brother's 1 year manufacturer warranty. Brother labels are perfect for signs, shelf tags, cabels, wiring or name badges and lots more. Use them to organize files, computer disks and videos or label outlets, cables and switches. You can even use Brother labels around the home or in the garden. Brother DK Labels - Die Cut Printer Labels for just about in need and this thermal print technology means no toner, ink or ribbon costs! Need a Label Printer User Guide - we now have them available for a free download.